I love summer for its warmth, flowers, vacations and thunderstorms, but I also love it for the cookouts. My family and I love sharing our Southern culinary specialties with our Northern friends. And like any good Southern dinner party, at least one of the recipes is from (or inspired by something from) the latest issue of Southern Living. For this particular dinner, our main course came from Southern Living, but here are our my family’s Southern Summer Cookout favorites. COCKTAIL: Mama’s Peach Sangria. How can you say no to peach? Add all ingredients to a pitcher. Stir. Chill until ready to serve, or serve immediately. 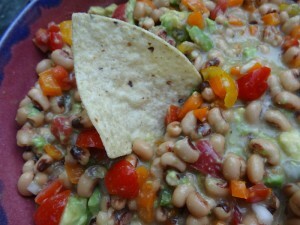 APPETIZER: Texas Caviar. This one gets requested a lot. Mix all veggies in a bowl. Pour Italian dressing over top. Sprinkle with cilantro. Stir, cover and chill until ready to serve. It tastes best with tortilla chips. For our main course, my dad grilled pork chops according to this Southern Living recipe, with an extra touch of mustard-based barbecue sauce on top right as they finished grilling. 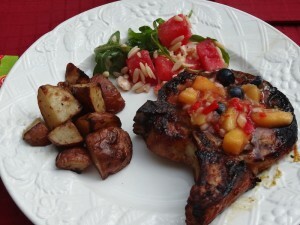 We topped the chops with the blueberry-peach salsa, which was a wonderful sweet companion to the flavors that came out in the pork. The watermelon-and-feta orzo salad was a cool and crisp companion to the dish’s star attraction. Of course we needed a starch, too: roasted potatoes, lightly tossed in olive oil, salt and pepper. This was my mama’s Grannie Adams’ recipe, so I know it’s tried, true and delicious. 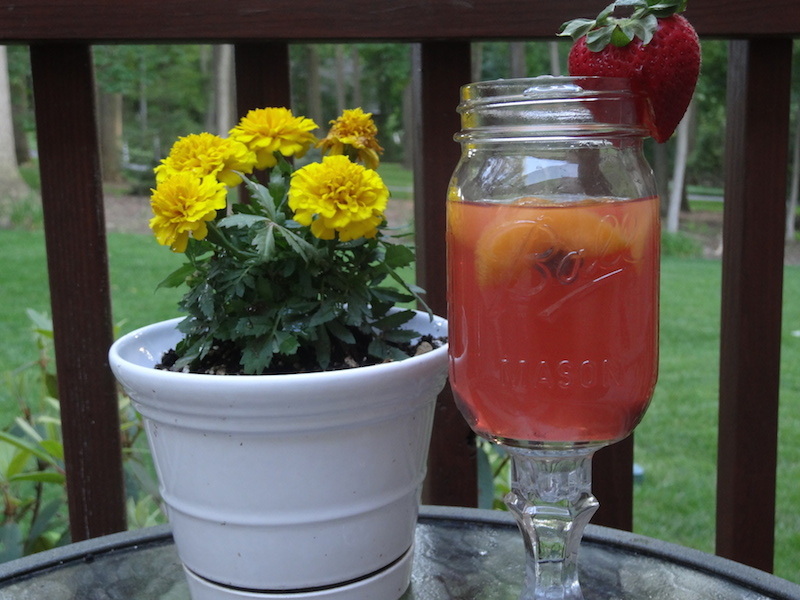 My mama makes it at home a lot during the summer; it’s very light and fruity, which if you ask me, is the perfect summertime dessert. You can make it with any kind of pie filling you want. My favorite flavor is strawberry, but my mama and dad prefer cherry and blueberry. Melt the butter and add to graham cracker crumbs. Stir until it forms a wet but crumbly mixture. Spread and mash half of it into the bottom of a 9×13-inch casserole dish. Mix the Dream Whip and milk until light and fluffy. Add the cream cheese and sugar and beat until well combined. Pour half of the cream cheese mixture over the graham cracker layer. Add both cans of pie filling over the cream, and then pour the remaining cream cheese on top. Lastly, cover the top layer of cream cheese with the last of the graham cracker crumbs. Chill two hours, or until ready to serve. Helpful tip: the longer it’s chilled, the better it stays together and the longer the flavors all have to blend.